If you’re ready to share the pleasure and excitement of scuba diving with your kids, congratulations! Having family members with whom you can enjoy quality outdoors time is enviable to many. Scuba diving, in particular, can be a very rewarding pastime, especially if you get to show amazing underwater sights to your children. But before you head out to your favorite diving spot, make sure you’re all geared up safely. For the little ones, this means specialized gear, designed with them in mind. To help you pick the right items, here is our ultimate list of the best kids scuba gear currently on the market. We’ll go through what makes each of them stand out, and dive into some FAQs and other considerations to keep in mind. Let’s get started! 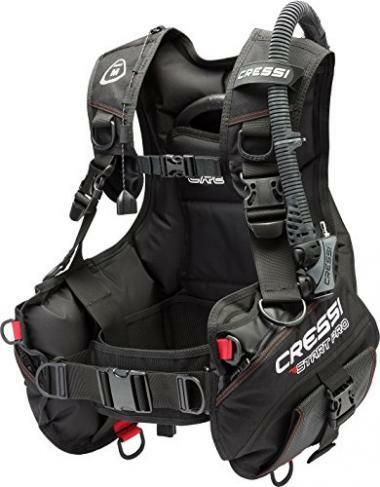 Cressi is for many a go-to brand when it comes to quality items for watersports. Established in 1946, this Italian house is one of the market leaders for the diving equipment sector. 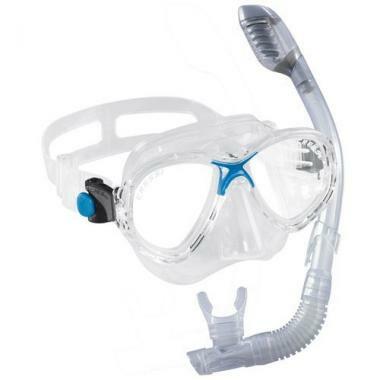 Their high quality but affordable items are the favorite of many, and this youth and kids snorkeling mask is no exception. As all good dry snorkels, the mask doesn’t need to be cleaned when you come back to the surface. The size is ideal for kids and youth, so you’ll prevent all mismatching issues. The mask comes with a black reusable storage bag. The silicone skirt with tempered glass lenses ensure a high-quality image and a comfortable wear. It also includes a 2 year warranty, so you can rest assured that you’re buying a top product. According to other scuba gear for kids reviews, it will fit children as young as 6 years, with plenty of growing room, too. This is a great scuba diving jacket for beginners, and is also small enough to fit most kids. It’s really the ideal jacket item for a complete set of scuba diving gear for kids. Better yet, it’s super strong and safe, being able to resist even the harshest wear and tear pressures. Initially, this Cressi jacket (yes, another item from the reputable Cressi brand!) was designed as a rental BCD for resorts and scuba schools. It’s bulletproof for recreational drivers, and also strong enough to rent. Also, it comes with a quick release integrated pocket, meaning it’s easier and safer to use than most other comparable items. If you’re a bit worried about your kid’s safety while diving, this is the perfect scuba diving BCD to put your mind at ease. A few pairs of diving fins are a mandatory addition to the arsenal of every family of diving and snorkeling fans. 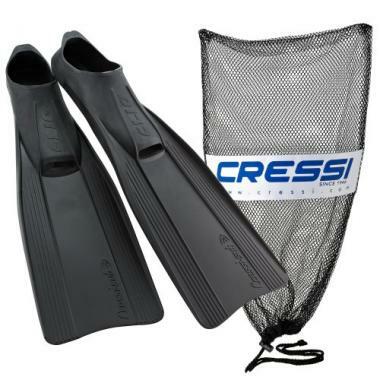 These kid-friendly, universal size fins come with the added advantage of being manufactured by Cressi. This means they will be comfortable to wear, will fit your kids even as they pass through multiple growing stages, and they won’t deteriorate as fast as similar fins from less reputable brands. 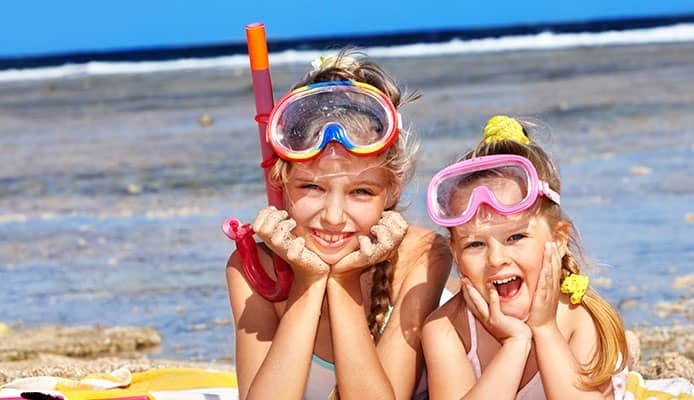 If you’re preparing to go snorkeling or diving with other family members, including little ones, this should be a part of your dive checklist. This highly popular kids scuba diving suit is not only a perfect companion for diving and snorkeling, but can even be used in the pool as a warm suit. Its temperature regulating properties are so good, that with the help of this suit even the kid which gets cold in the swimming pool right away will be able to enjoy it. 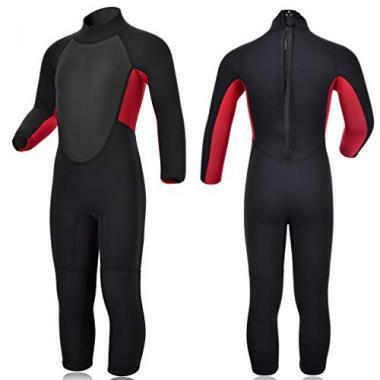 As part of a top rated kids scuba gear list, the wetsuit will feel like a dream come true. It’s light and easy to wear) only 3 mmm thickness), perfectly isolating from the cold, and with an all-over UV shield of 50 SPF. The suit is flexible but highly resistant to abrasion, as well as impervious to stings from jellyfish, sea lice and so on. Basically, if a kid is wearing this, they have every reason to get over scuba phobia and join you on an epic adventure. 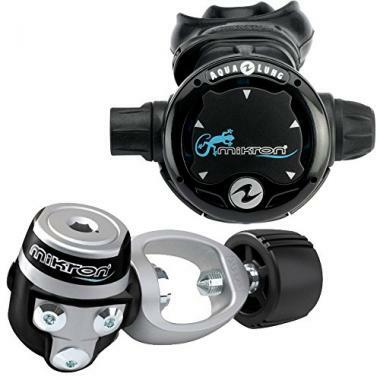 This scuba regulator has a reduced size compared to the regular dimensions of similar items. That makes it a great child scuba gear, since it fits kids better than the adult sized regulators out there. For some reason, the item’s production was discontinued, though it is still on the market, though for a limited time. It’s a great opportunity for all who are looking for great scuba diving gear for kids to get it before the stocks run out. What else should you keep an eye out for when shopping for the best scuba gear for kids? Here are the basic criteria to consider before making a buy. One of the main characteristics of specialized diving equipment for kids is the size. In all other respects, these items might not be very different from the best dive safety gear for adults, but they are smaller a much better fit for children. When you’re shopping for a new item for your kid’s diving gear, take into account the exact age, size and weight of the child. Most items for kids are pretty flexible, but if your child is atypical in one aspect (their size or weight are less conventional, for example), then pay extra attention to the item specifications. Just like adults, kids learn scuba diving and become more experienced as they practice. You don’t need to consider just their size, but also their level of knowledge about diving. As you may have noticed, some of the items on our list of the best scuba gear for kids also mention that they are perfect for beginners. These are the ones you should start with, since they can help your child learn the art of diving faster. You can then work your way towards the more pro-like ones in time. Depending on the type of dive you plan on practicing with your kid, some different type of gear may be needed. In the beginning of your diving adventures together, it’s obviously recommended to stick closer to the surface. 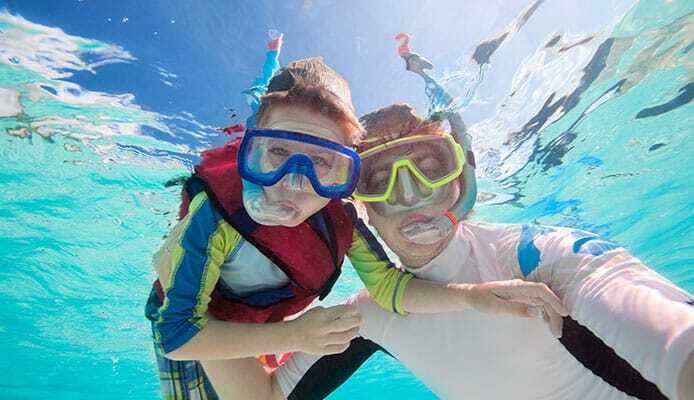 In these instances, a snorkeling tube may be al your child needs in order to ensure underwater breathing. But for deeper dives, your list of diving equipment for kids will need to include an oxygen tank and mask. Q: Should My Child Go Scuba Divng? A: As long as you see no sign of your kid being averse to the idea or too scared of water to even try, there’s no reason for which a kid shouldn’t try scuba diving. As long as you keep away from the most dangerous or scary types of activities, like scuba diving with sharks, there’s nothing to worry about. 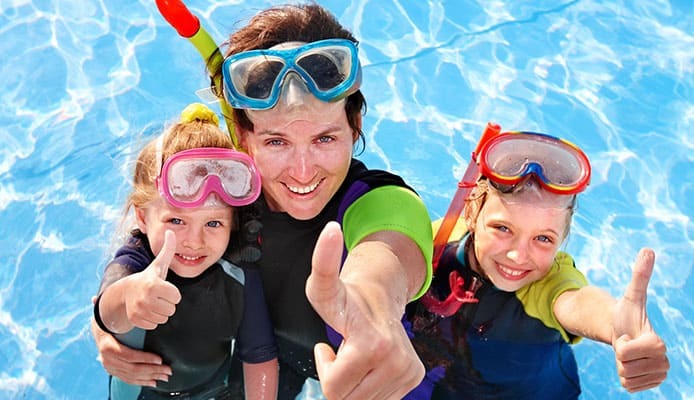 If you, the adult who will accompany him or her, are already somewhat experienced with diving and will protect the child, the activity is perfectly safe and super-fun, so go for it! To make sure the kid is ready to experience this, just follow a few essential preparations steps. The first one is to gear up accordingly, which should be easy enough, we think, after reading this list of the best kids scuba gear. The second is to make sure the child has a good understanding of how diving works, what to expect, how to communicate with you while underwater and so on. Have your kid read our list of the most common scuba diving myths, our guide on how to prevent vertigo while diving, a few scuba diving breathing techniques for beginners, and how the scuba diving buddy system works. Q: Is Scuba Diving Safe For Children? A: As long as you don’t forego these special preparation steps and you gear up according to safety rules and regulations, scuba diving is safe for children as well. If you’re not very confident in your abilities of preparing your kid for diving, then maybe enlist the help of a scuba teacher as well. A few scuba diving lessons before you head right in can’t hurt. The prospect should be very attractive for the little ones: which kid wouldn’t want to learn how to swim like a mermaid, for example? You should also try to limit the time spent underwater according to your kid’s age and ability. For younger kids, breathing through a mask may prove to be more uncomfortable. Take it one step at a time and spend just a little time diving at once, then a bit more time in the next session, and so on. Q: Is This Gear Made Specially For Kids? A: When diving with kids, or when practicing any other watersport with them, you can’t really use the same gear as for adults, in most cases. While general scuba gear packages can be everything an adult needs to get started, children need gear made with their particular size and needs in mind. Of course, many pieces of diving equipment for kids are not really designed for the mental age or bodily capacities, but for size and weight. For example, a piece of size-sensitive youth scuba gear, fit for teens and pre-teens, would also work perfectly well for a smaller adult (like a petite woman of 50 kilograms). With this in mind, rest assure that top rated kids scuba gear is indeed designed with children in mind, and is thus the safest and most comfortable option for them. Being able to enjoy adventure and outdoors time with your family should make us all feel blessed. If you’re one of the lucky ones who can share their passion for diving with their kids, you must have fun memories behind and ahead of you. Still, safety should always come first, especially when children are involved. That’s why we hope our list of the best scuba gear for kids helped you pick up your essentials, so that you’ll be ready to roll in no time. Happy family diving! Watersports Center Safety Guidelines, LCSD.gov.hk. Diving Health and Safety, HSE.gov.uk. What kind of scuba gear for kids have you bought or used so far? How does it differ from the gear you use for yourself when you go diving? Is there a brand you would recommend for the best scuba gear for kids? Let us know in the comments below! We’re always happy to hear from our readers.